Best co-sleeper bassinets are perfect if you have a newborn or very young baby, then chances are that you want to remain as close as possible to your baby at all times, even when they are sleeping. Traditionally, a crib has been the main choice for parents, yet with the increase in popularity of co-sleeping, bassinets have become a very popular choice. Unlike cribs, bassinets offer you the ability to be versatile with your sleeping arrangements, as since they are small in design they are typically portable and perfect for setting up next to your bedside. The small design of them is also often comforting to parents who find the concept of their little one in a full-size crib a daunting prospect. This Bassinet by Arm’s Reach Concepts is perfect for positioning next to the bed for co-sleeping with your newborn for hands reach access and convenience. Its portable design means it can be folded down with ease and transported elsewhere, ideal for elderly caregivers who may struggle to navigate staircases. Having wheels also means it can be moved to either side of the bed, making it easy for both parents to share caregiving duties hassle free. The storage shelf underneath is also extremely roomy and will easily fit changing bags, diapers, bottles, toys or anything else that may be required when attending to your little one. The large storage capacity is perfect for small homes or those struggling for storage elsewhere. The bassinet also includes a very comfortable mattress which is a great extra, helping to make your money go further. Often mattresses included with sleepers aren’t the best, but this mattress is firm and soft, perfect for newborns. The design color and styling itself is neutral meaning it will fit quite nicely with a range of interiors and is suitable for both baby boys and girls. The bassinet itself also features a breathable mesh that surrounds all sides providing a nice barrier between their sleeping space and outside world for a disturbance-free slumber. This alternative Bassinet veers away from the more traditional square design and has an extremely reasonable price tag for what it offers. At just under 9 pounds, it is one of the most lightweight designs we found, meaning it’s easy to fold up and carry around the house or put in the trunk of your car. Although it does lack the storage space found in larger bassinets, it does have the advantage of a complete sleeping set that can be removed and placed in the washing machine, making maintaining good hygiene standards for your baby a top priority. It also features a hands-free rocking feature and plays gentle sounds sure to help any baby get the sleep they need, although this feature does require it to be plugged in to operate. Another key feature of this bassinet is the slight incline, which promotes sleep and can aid digestion, especially in babies who may be suffering from some acid reflux issues. However, bear this in mind since the bed cannot be made to lie flat, so ultimately it comes down to personal preference and your specific situation. The Graco bassinet is probably not the preferred style of many parents, yet its modern design is reflective of the innovative features it has and it has certainly been well thought out. It includes storage, a canopy, toy stores and vibration to aid sleep. The large canopy is ideal for aiding a baby’s sleep, helping them to shut off and separate from the world outside and start to wind down for sleep. It also acts as a sun shield should it be a particularly sunny day, making it ideal for every season of the year. Better still, the mattress pad is completely removable and can be cleaned in the washing machine, perfect for busy mums and dads and for maintaining good hygiene and cleanliness. The wheels are also helpful if you need to adjust the position of the bassinet from room to room. The wheels themselves are also lockable, helping to prevent the risk of any potential accidents. The basket itself also rotates to provide a neat baby changing area, perfect for those with limited space or those who may like to keep everything in one space. The large storage area beneath will easily hold a few packets of diapers too, therefore helping to enhance the utility of this bassinet. However do keep in mind that the canopy can’t be removed, so it may restrict the ease of taking your baby in and out of the bassinet. In addition, only having mesh on an area of the side’s means you may struggle to see your baby from certain angles. This uniquely designed bassinet by Halo is the perfect solution for mothers who may have difficulty moving and reaching for their baby, especially woman who has recently had a C-section of given birth. The swivel design means it has the ability to be rotated 360 degrees and so can be moved wherever you choose, whether that be next to your bed or even slightly over it if you happen to own a particularly low bed. Either way, this feature is handy and it can be locked in place, ensuring it won’t be knocked, which could potentially disturb your sleeping baby. The breathable mesh design is also on all sides for maximum visibility of your sleeping child. It also includes a waterproof and JPMA certified mattress and fitted polyester sheets that are safe, hygienic and very easy to clean with a simple wipe or have a thorough clean in the washing machine. This bassinet does come with limited storage that is adequate enough to fit some small items such as a bottle or a few diapers, yet it doesn’t provide anywhere as near as much storage capacity as some of the other bassinets reviewed earlier. This bassinet is advised for those over the age of 5 months and up to 5 years, but it is a sure sign to transition to alternatives when your baby begins to pull up, roll over or kneel. We believe that the best bassinet is the Graco Dream Suite as it offers all of the features that would support newborns and mothers who want to start co-sleeping safely. The design means it is a good option for small spaces and its portable design means it’s perfect for traveling with. The vibration feature is also ideal for aiding a sound sleep and low sides mean that your little one will be easy to reach and attend to – particularly important for mothers who have recently had a c-section. The major difference between a crib and a bassinet is the size, with bassinets being a smaller and portable option. This means they are preferred by parents who don’t have large bedrooms or adequate space to fit the often chunky dimensions of a crib. Another benefit of bassinets is that they are lower than cribs, meaning your baby will be at arm’s reach making them an ideal solution for mothers who struggle to lean over e.g. those recovering from a C-section. There are more key differences and considerations to go into which we outline and discuss in further detail in our bassinet or crib article. Check it out! Mattress Type – make sure to look at the mattress, some brands and models offer an ASTM approved mattress that is ideal for parents wanting peace of mind and comfort for their little one. One thing to be wary of is MDF bases that have been noted to release chemicals and although only at low levels are not ideal for a baby’s bed. Mesh Sides – the majority of bassinets are fitted with mesh sides which obscure the light and other distractions to aid sleep. 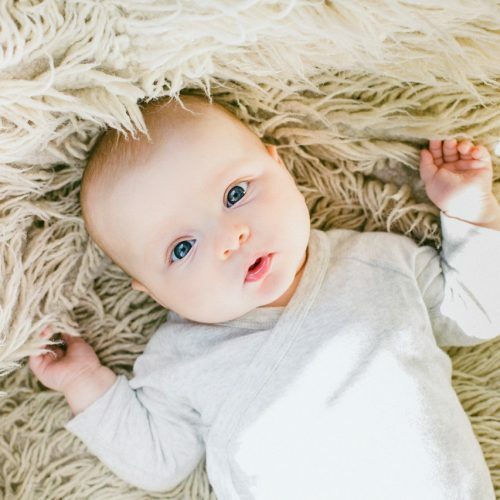 Although the majority are designed to be breathable, it’s important to ensure your baby is adapting well to their new sleeper and that it isn’t pressing to close to their faces due to a poor design. Portability – unlike cribs that are often heavy and large, bassinets are often small and light enough to be packed away and transported. Therefore, it’s a wise move to check how long it takes to pack it up and how easy it is to do so, a carry case is often preferred too. Storage – many bassinets offer handy storage compartments and built-in bottom shelves, perfect for storing diapers, bottles and a range of other baby accessories. So, if you like the idea of having some extra space then makes sure you check the product details. Calming Features – its common knowledge that a tired baby can be soothed to sleep with the help of rocking and a nice lullaby. If you have a baby that responds well to noise and movement, then you might want to consider a bassinet that vibrates rocks and plays tranquil sounds to help your baby to sleep. Side Walls – you will find that the type of walls on bassinets varies between brands and styles, with some having low walls and some relatively high. The one you choose obviously comes down to personal preference, but many parents do prefer low side walls as it allows for easy access when attending to your baby. Safety and Certification: There are particular standards which bassinets need to meet to be deemed safe to use which are set by the U.S Consumer PRoducts Standards Commision (CPSC). Find out much more in our article about bassinet safety. Reduce the risk of SIDS – bassinet safety have demonstrated that having your baby sleep in their own space directly next to the bed helps to reduce the risk of SIDS. Having your baby close also promotes peace of mind for many parents who prefer having their baby close throughout the night and day. Convenience and comfort – Having your baby next to your bed mean that things like diaper changing, feeding and comforting them are all more convenient tasks to carry out, especially for new mothers who may feel rather dedicate themselves. It also means that all of the necessary items, such as blankets and diapers can be stored underneath the bassinet for easy access and maximum convenience. Supports Postpartum Recovery – Shortly after giving birth to their baby, it can take mothers some time to recover, physically, mentally and emotionally. This is even truer for those who have undergone a cesarean section. A bassinet is much more suitable for recovering mothers. Portable Sleeping Space – Newborn and young babies can do a lot of sleeping, yet the thought of staying home so much can become a daunting prospect for many parents. That’s why having a portable place to sleep when you are out of the house or traveling is so great. Bassinets provide this portable ability without the heavy load of a crib.